Boil the potatoes in their skins until they are tender (if you poke one with a knife point or skewer, it goes through easily). Heat up a large frying pan. Heat up the sesame oil. Add the potatoes, and pan-fry them until they turn brown and crispy. Add the paste to the hot pan and toss the potatoes around rapidly to coat them well. The water will evaporate and the sauce will turn very sticky. Take off the the heat before the miso burns. Serve sprinkled with lots of chopped green onions. This is a very rich and strongly flavored dish, almost a meal unto itself. In Japan it would be a side dish, eaten with rice and soup and a couple more dishes such as grilled fish or meat plus pickles or salad, etc. You could serve these as a side dish as part of a Western style meal. It's a great vegan dish - you could add some pan-fried tofu or seitan or something to go with it. 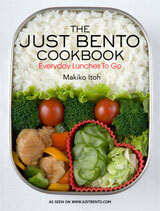 It's also very nice in bento, but I do prefer it when it's still hot from the pan. For a non-spicy version, omit the kochujang and increase the miso to 3 tablespoons. This non-spicy version would be more traditionally Japanese, but I like a bit of heat to cut through the sweetness. Submitted by maki on 2008-08-09 13:29. 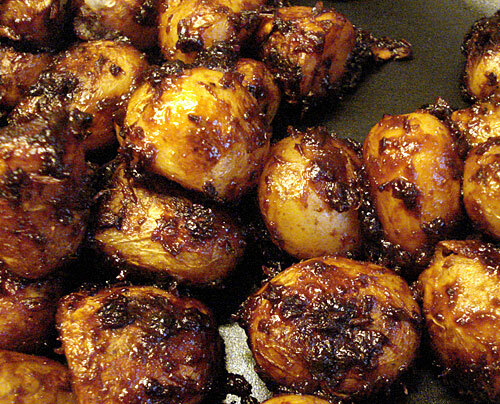 New potatoes with miso sound good. I've never tried potatoes with miso, so it's time to try. I have a box of miso in the fridge right now. Thanks for sharing! UGH! I really want to make these miso kind of dishes, but i cant ever seem to get them right! Whenever i add the miso, it either just stays the same consistency and colour, so it doesnt really blend together, or it is way way too salty. I bought some miso from the supermarket, it was the Hikari brand of miso, but it is sooooooo salty. And i tried to make nasu dengaku, but it didnt work, the paste just stayed the same, i saw pictures of how its meant to be, but it just stayed like uncooked miso paste. EEK!!!!! Is there something that im doing wrong? Am i not cooking it for long enough? The miso definitely doesn't taste like pond water. In this recipe in fact it is quite sticky (in a good way). It is sweet-salty-spicy (spicy from the kochujang). You can also try a kind called 'saikyo' miso, which is pale yellow-brown and very sweet, but this can be quite expensive. ok thanks for your help!!!!! ok thanks for your help!!!!! I will definately take note of your tips! THANKS!!! Hello! I was just wondering if you have a recipe for that dressing that is always served in Japanese restaurants? Its yellowy brown, and it is abit pulpy. It tastes abit like sour cream and chives, and its usually poured over sliced raw cabbage. Have you heard of it? You may want to search for 'benihana salad dressing'. It's not remotely authentically Japanese actually (neither is the rest of Benihana) but it did get copied by many so-called Japanese restaurants in the '80s and early '90s or so. Hi Maki. Thankyou for the information! I just love this sauce!!!!!!!!!!!!!!!!!!!!!! this sounds so yummy! And I love new potatoes because you can eat the peel, which you can cook to a crisp. I just made this for dinner and it was delicious! I ate it along side a soup - udon noodles, asparagus, broccoli and peas in a green tea & soy sauce broth - and some brown rice. This potato dish looks terrific. Those flavors sound great! Be careful when cooking the miso glaze onto the potatoes - the sugar in the glaze means nice caramelization on food, and a nasty, sticky, blistering-hot blob that can spatter out and leave a second degree burn on your skin before you can get it under cold water. You'd think I'd have a firefighter's suit by now, considering how often I burn my hands in the kitchen. Finally made these potatoes last night. They went down a treat. What a brilliant combination. I have developed somewhat of an addiction to kochujang sauce to recent months. Hubby liked them so much he is planning a large plate of them for dinner tomorrow night and nothing else! I just tried this recipe today and it tastes absolutely fantastic! Definitely going to be making this quite often. However, I only realized that you did not mention when to add the sugar while I was halfway through cooking. So I just added it to the miso-kochujang paste and it turned out well still. Thought I would let you know. Thank you! Love the recipe! I love these potatoes. The flavor is wonderful and they are a snap to prepare at the last minute. Thanks! Hi, Maki - I love these potatoes (store didn't have new so I used red). I made them for dinner tonight along w/ chicken tsukune dumplings w/ carrots and bean sprout namul. I'm gluten intolerant so I substituted the kochujang with chili garlic sauce (the Vietnamese sauce w/ a pic of a rooster on the container) and it was delish. Actually everything was wonderful! I'm wondering if you can tell me if miso paste can be frozen. I read that your 'miso, tahini, and walnut paste' can be frozen but what about miso paste itself? I get conflicting answers from google :p.
I don't see why you couldn't freeze miso - but there's really no need to since it's a preserved food. People used to keep it in the cool area under the house in big tubs. You can keep it in a cool, dry dark area for at least a year or so, and even longer in the refrigerator. I just made this and it was so good... I didn't actually have any new potatoes, just regular ones and I also don't have the Korean bean paste, but it still turned out wonderful. 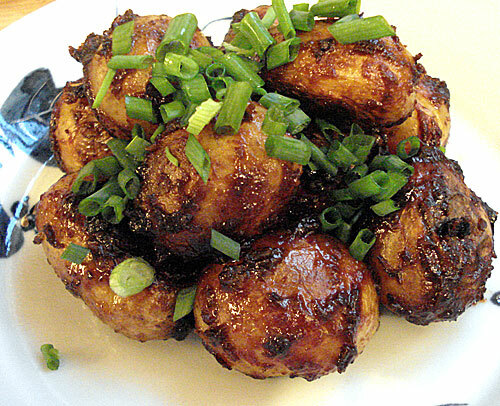 The miso glaze is salty, sweet and so deep in flavor, perfect with the blandness of the potatoes. I will make this recipe again for sure. Thanks for posting it! Had this for lunch today with a sesame-spinach sunomono and tamago-yaki. It turned out well, though to get the "ketchup-like" consistency for the sauce I added a little bit of water. Fantastic idea! I'm sure I'll be making it again. This dish could also fit into a Chinese meal with ease. Hmm, the egullet site doesn't let me view the image (I get a 403 Forbidden error). Sorry for bugging you! Thanks again! I can't read Korean, but the characters seem to be more or less the same as the ones on my box of kochujang, so I'd say it's probably ok :) (it should taste spicy with a lot of umami). Yum! The whole family loved this. 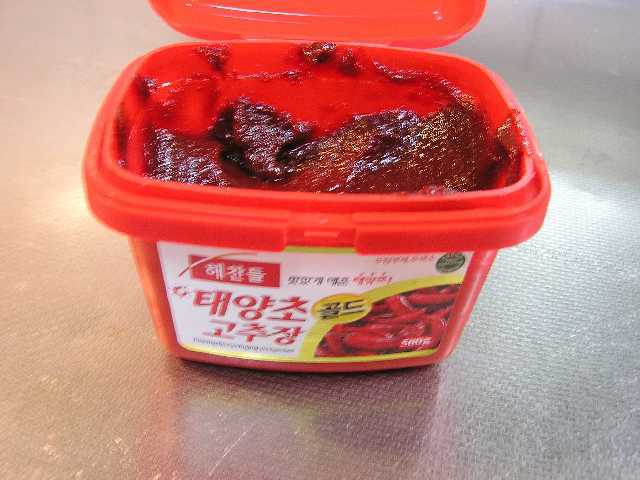 And I'm so happy to have discovered kochujang -- it's delicious, with just enough heat to make it interesting. Made this for the family, such a delicious recipe. No leftovers, and I'm kind of sad now. For what it's worth, y'all, I just made this with white sweet potatoes and it is fantastic. Thanks, Maki! The leftovers I had from this recipe actually made a really delicious addition to my breakfast the next day. I threw the leftover potatoes in a pan with a couple eggs and scrambled them together. Topped with some sharp cheddar and bacon crumbles, ooooh so good. Your recipes really are the best. Thanks so much for posting them. is chili paste, with fermented soybean and other stuff. You can also describe is as fermented soybean paste, with chilies and other stuff;) If it is red and spicy/salty/sweet it is gochujang. If it is brown and pungent, but not spicy, it is fermented soybean paste, or doenjang. To simplify matters for us, the most commonly available gochujang and doenjang in the US comes in red and brown containers respectively, and the gochujang usually has an illustration of a chili on it. Doenjang is very very umami, and thus much harder to love at first taste than gochujang-but critical for good home cooked Korean food. I don't know if it has any application in Japanese cuisine. Do you think doenjang could be used like a strong aka miso for flavoring/saucing (but not soup except when going for funky deliciousness)?